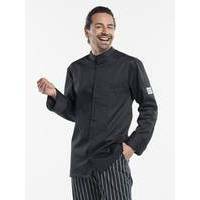 The Chaud Devant Chef Jacket Executive is a trendy chef jacket in every way. The Straight fit combined with the central blind fastening makes quite an impression and the luxury breast and sleeve pockets complete the look. The satin weave means that the Chaud Devant Executive jacket drapes beautifully around the body. Tip: leave the top button open to create a nonchalant look.